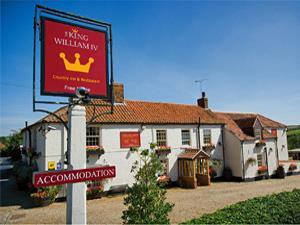 The King William IV Country Inn and Restaurant is set in the village of Sedgeford, just 3 miles from the North Norfolk Coast. RSPB reserves at Titchwell and Snettisham are close by as is the renowned Peddars Way hiker's path. For golf enthusiasts the traditional seaside links at Hunstanton and Brancaster are within a 10 minute drive, whilst the historic ancestral homes of Holkham and Houghton are nearby. The Royal Estate at Sandringham is nearby. The King William IV has 4 restaurants and 9 deluxe double/twin bedrooms, all with en-suite facilities. Cycle storage available. Sorry, but we do not cater for hen/bachelor parties. Close to Peddars Way, RSPB bird reserve, coastal path, beach & Sandringham. Children welcome from any age. Approaching from King's Lynn, follow the A149 to Hunstanton and turn right at Norfolk Lavender in Heacham onto the B1454 signposted Sedgeford/Docking/Fakenham. From Fakenham, follow the B1454 through Docking to Sedgeford. From King's Lynn station take the bus to Hunstanton, getting off at Heacham. 2 miles away. No Public buses pass through Sedgeford. Taxi recommended.